I remember growing up enjoying freshly made homely food. The only 2 items those were made ahead and preserved were pickles and coconut chutney powder. Before the monsoon starts, green mangoes are brined in big ceramic jars and sealed; they are preserved for rest of the year. Likewise all the tubers and coconuts were harvested and store in dark store room. These routines were religiously followed in my grand parents’ house. We used to get a good share of home grown goodies even when we moved to our house from the joined family. Among the special preparations, the one for coconut chutney was most eventful and exciting one. On the day of chutney making, the specially picked dry coconuts are double checked for readiness. Then the helpers start their exertion of husking, grating and dry roasting the coconut with a special blend of spices and shallots. The exquisite aroma of dry roasted coconut then propagates to the whole neighborhood. The most amusing part for me as a little kid was to watch them ground the chutney in the huge stone handheld grinder (Ural & Olaka). There will be two ladies who will be performing the art of grinding the chutney with hand held long pestle at the same time. They follow a rhythm for grinding by alternatively using their pestle to ground the chutney without hitting other person's pestle. You hear the chit chats and exchange of gossips during this time. In between my grandma comes to check the readiness of the chutney and keeps the helpers focused. A bigger batch of chutney made with at least 40 - 50 coconuts surely needs lot of man power, so the whole day exertion ends around evening during the snack time. The freshly ground chutney is all set to be packed and send out to different places where other family members are. The job of packing starts once the chutney cools down. The whole day event ends with a satisfaction on my grandma’s face with a smile for a good job done. The helpers are paid their wages and my grandma makes sure to pack a batch of chutney for each person. The old stone handheld grinder is still in my uncle's house back in India and it is still used to make bigger batch of chutney powder when we visit. I enjoyed chutney powders mostly during my hostel days in the college life. The only tasty sides we had with our bland hostel meals were the coconut chutney powders and pickles that each one of us brought from home. So I had developed a special love towards the coconut chutney since then. Our classmates used to bring different kinds of chutney powders that they served with Dosas (lentil crepe) and Idlis (steamed lentil dumplings). They were really delicious and expanded my know how of different kinds of chutney powders. Today's recipe is a special chutney powder made out of horse gram. I had never used horse gram in my life before and didn't know anything about it till I saw it in the Indian grocery store recently. After researching and realizing the medicinal value of this legume I was determined to use it. I found different kinds of chutney recipes online, but wanted to try the dry version with some improvisation. They are well know for their diuretic properties. It is used as diet to reduce weight. Horse gram helps to reduce cholesterol levels with the soluble fiber present in them. Studies shows that the lipids found is horse gram can help to treat peptic ulcer. They are excellent source of protein and iron. Like any other food, it should be taken in a moderate level. Excessive consumption of Horse gram can cause increased bile production. 1. Rinse the horse gram twice with cold water and drain. Spread it on a kitchen towel and wait for 5 minutes. Transfer it into a heavy bottom kadai or non stick pan. Dry roast on low to medium flame for 5 minutes till it turns to light pink. Transfer it to a bowl. 2. Dry roast the grated coconut on very low flame till light brown color by stirring continuously for 5 - 8 minutes. Transfer it to the bowl. 3. 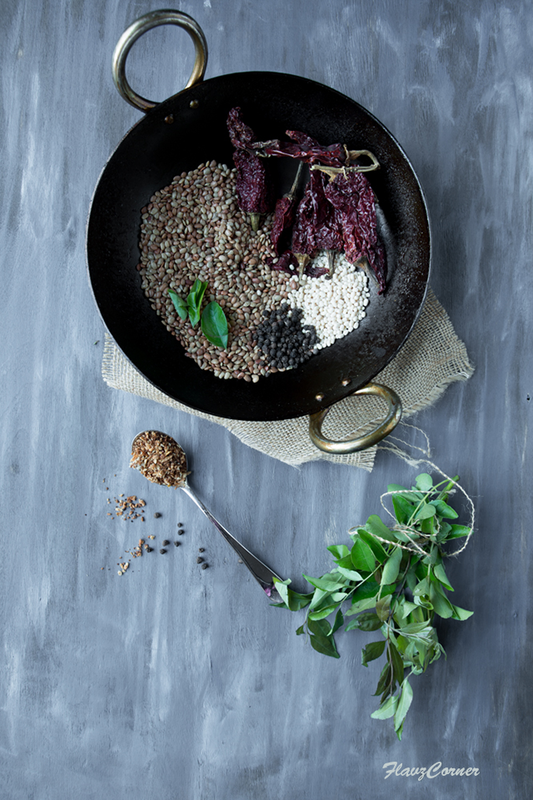 Add 1 tsp of oil in pan and slightly brown the urad daal, then add kashmiri chili, curry leaves and peppercorns. Roast on low flame till the dry chilies are crisp. 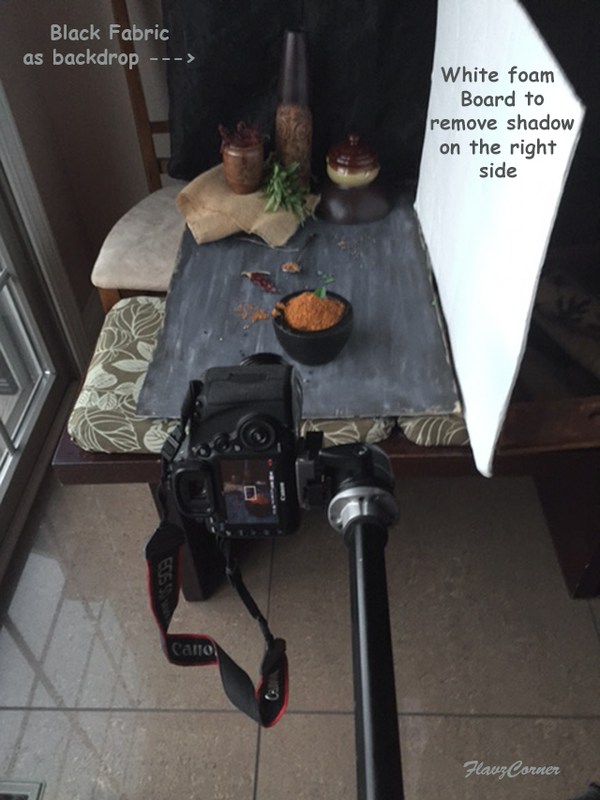 Add the tamarind piece and mix for another minute. Add the roasted coconut and horse gram back into the pan and mix well for a minute and turn off the flame. Add salt at this point. Let the mix cool down little bit. 4. Grind the mix in a blender or spice/coffee grinder in batches to get a coarse chutney mix. Check the salt in between and adjust as necessary during the grinding process. 5. 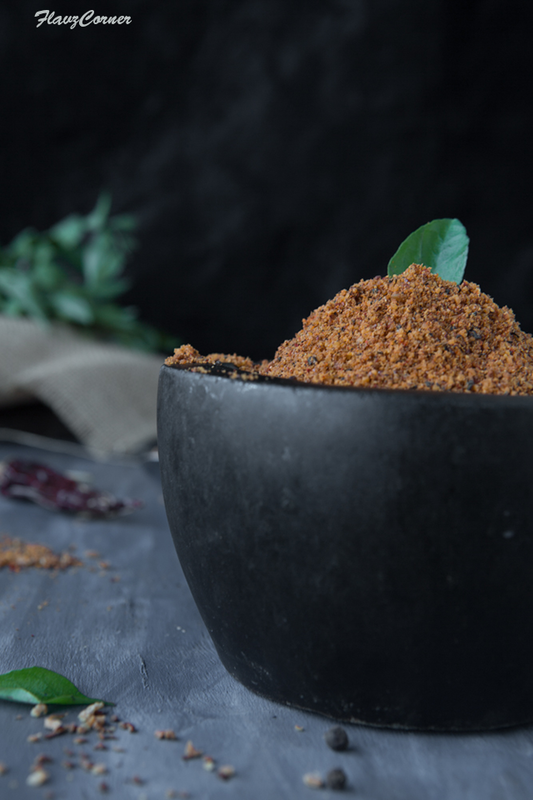 Store the chutney powder in a clean air tight container at room temperature. They can stay fresh up to a month. 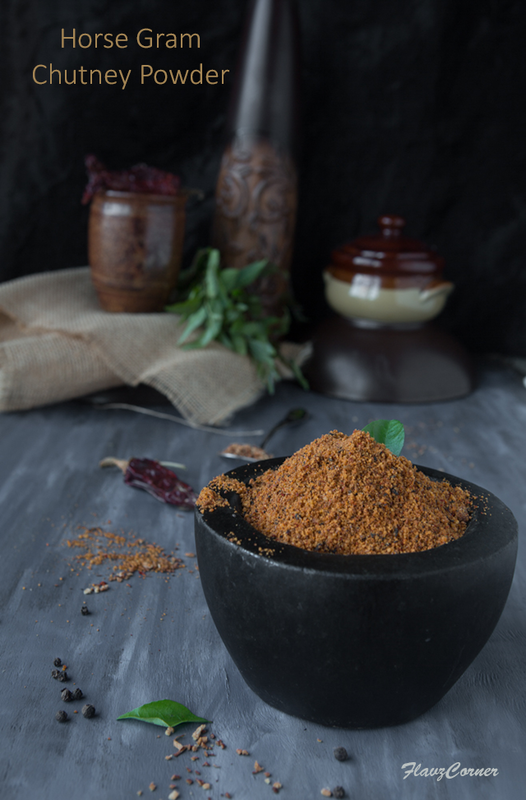 You can enjoy the chutney powder with steamed rice, Dosas or Idlis. I have never tried making chutney powder...thanks for sharing! Horse gram is new to me! But won't be a stranger. Fun stuff, and love the pictures. Thanks!